Al Moss, the founder and spirit of Moss Motors passed away Tuesday night, September 25, 2012. Here in our building and in our catalogs, too, Al’s presence is still palpable and will be, we hope, as long as we are in business. We are better because of it. Moss Motors didn’t start out to be a restoration parts business at all, and if E. Alan Moss had bought a Ford instead of an MG TC things might have turned out very differently indeed! Al was then a young man living in the emerging Los Angeles powerhouse, and the lure of the TC, known as “The Sports Car America Loved First,” was irresistible. After reading about the successful road rallies being held on the East Coast, Al decided to organize one of the first West Coast rallies, this being the summer of 1948. The rally, which ironically enough ended in Santa Barbara, brought Al into contact with a bunch of fellow MG enthusiasts. However, apart from a passion for British cars they all shared a common problem—parts for these cars were just not available at the local service station and invariably had to be specially ordered to keep these early post-war vehicles on the road. Al had served an apprenticeship in front-end alignment and owned some garage equipment. He saw an opportunity to combine his love for sports cars with the chance to make a living, figuring that a shop working on front ends and the occasional TC of a friend, might work out. So he took the chance and rented a shop at 3200 Olympic Boulevard in Los Angeles, where the very first Moss Motors sign was hung outside the door. More than the sign was hanging out here, however. 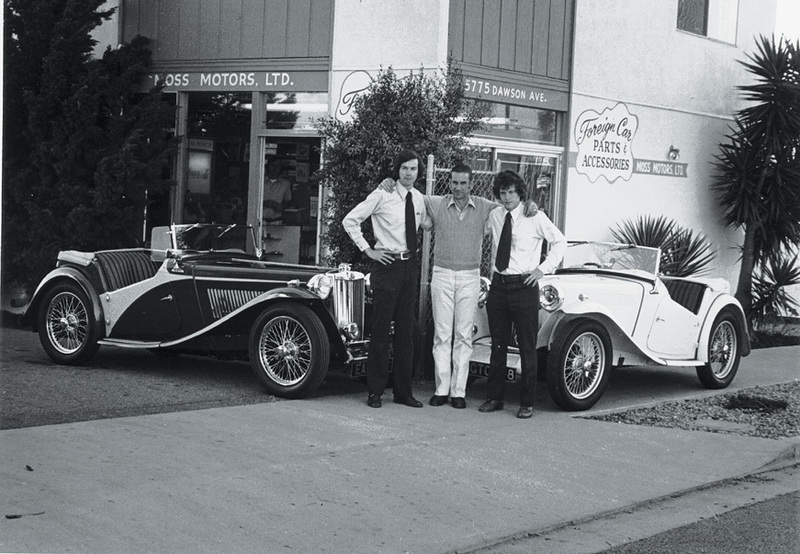 Al’s British car-owning buddies started to hang out at the shop, and more than once the shop closed its doors for an afternoon because his friends wanted to drive to somewhere more “interesting!” Under Al’s leadership this bunch became the “Foreign Car Group”—one of the first sports car clubs in California. An attorney among them had suggested they used the word ‘Group’ instead of ‘Club’ to avoid potential insurance problems. Another collection of sports car enthusiasts gathered at Al’s shop every Saturday calling themselves the “Moss Motors Luncheon & Bench Racing Society”. Moss Motors was, by now, doing a great deal more than just front end work with Al buying and selling a few cars later in 1948. One TC Al sold for $1100 was to a teenager named Howard Goldman. Two years later Howard bought another TC from Al (which he still owns!). They became firm friends, and this friendship was to have far reaching implications. The logical expansion of this growing business was to begin selling new cars, and in the spring of 1950 Al became the West Coast distributor for Allard Cars bringing the first Cadillac powered Allards to the area. In addition he also became the L.A distributor for the Rootes Group selling Hillmans, Humbers and the Sunbeam-Talbot lines. The Allards were fast and had a richly deserved reputation for being extremely difficult to drive. Al raced one with some success, but a serious accident in January 1951 convinced him that his future might lay in other pursuits. He’d never really enjoyed the new car sales end of the business and so he sold the distributorships, in order to concentrate on the service and parts work he loved the best. Al moved to a new facility on Pico Boulevard, however, he soon outgrew this location and moved again, this time to Venice, just west of Los Angeles proper. Throughout the late 1950s, service work was the prime function of Moss Motors, however, since the MG TC had gone out of production in 1949, being superseded by the MG TD, parts availability was becoming a major problem. Al began to buy up lots of obsolete parts and even ventured into manufacturing some items. Thus with a supply of parts to support his own service needs, and an ever-growing demand from people who wished to undertake their own restoration and repair, Al prospered. Eventually, with more and more owners calling for spare parts it seemed logical to produce a modest catalog, and thus the first TC catalog appeared in 1962. By now, Howard Goldman together with his brother Philip, had, in 1958, relocated their family-owned company some 100 miles northwest of Los Angeles to the scenic city of Santa Barbara. After numerous visits with his friend Howard, Al decided to relocate Moss Motors to Goleta, a small town adjacent to Santa Barbara in 1961. And, with the mail order side of the business expanding rapidly, the decision was taken to drop the service side of the operation. Glen Adams, Al Moss and Chris Nowlan. Al was also going international at this time, making frequent trips to England to purchase discontinued parts which his customers urgently required. And Moss entered the computer age in 1970 with the purchase of an early IBM card based system. Rumor has it, that this very machine can be seen in some distant computer Hall of Fame! Also during the early 70′s, two junior members of staff joining Al were, Glen Adams, the current President of the company, and Chris Kepler, currently Vice President of Operations, and both are still here forty years later! The business continued to grow as enthusiasts embraced the British sports car movement and Moss expanded by adding parts and catalogs for the MGA, the early MGB, The Austin-Healey and the Jaguar XK120-140-150 series. In 1977 Al purchased 48 tons of ‘obsolete’ inventory directly from Standard Triumph in England, a shipment which filled no less than four 40ft containers, and was in fact, the largest single buyout of TR2-3-4 spares ever! Thus, in 1978 Moss Motors published the world’s first comprehensive TR2-3-4 catalog and this publication also represented a new philosophy. The catalog illustrated, and listed, virtually all the parts that would ever be needed for these cars, even if the parts were no longer available at press time. This made the catalog a valuable restoration aid and reference guide and set the standard for all future Moss Motors catalogs. By 1978 Moss Motors was supplying parts for British sports cars to customers worldwide, and in fact the business had become so large that it had ceased to be fun for Al, being more like work! It was at this time, that his long-time friend, Howard Goldman, offered to purchase the entire Moss Motors operation. Al eventually took him up on his offer and entered semi-retirement to spend much of his time restoring and racing his collection of British sports cars at his home in Arizona. At the age of 80, at the urging of his many friends, Al wrote his autobiography: The Other Moss: My Life with Cars and Horses. Certainly there will be many additional stories shared of the adventurous, thoughtful and humor-filled life Al Moss vibrantly lived. We are saddened by his passing, but so enriched by him having been with us.